Hi friends! I have a fun new printable for you today. 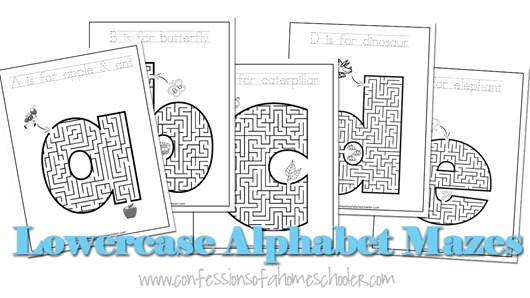 I recently created these Lowercase a-z Alphabet Mazes that coordinate with my Letter of the Week Preschool and K4/5 Kindergarten Curriculum, and best of all their free! YAY! You can print these and use with pencil, marker, colored pencils, or crayon to complete the mazes. If you would like to make them re-usable you can place the worksheets in page protectors and use them with dry-erase markers. Hope you enjoy my Lowercase a-z Alphabet Mazes! They coordinate perfectly with my Letter of the Week Preschool and K4/5 Kindergarten Curriculum! Feel free to add them into your lessons as you go through each letter! Did you miss the uppercase version? Don’t worry! 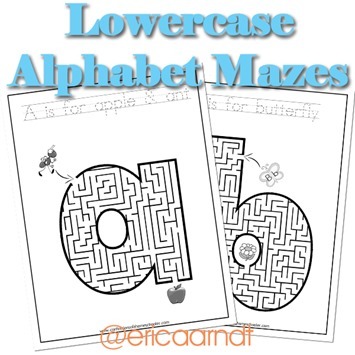 Click here to download the Uppercase A-Z Alphabet Mazes! The letter being practiced in the beginning of the sentences on the top of each worksheet should be a lowercase letter to reinforce the lowercase letter being practiced. I know it is the beginning of the sentence but it would go better with the lesson if it was lowercase. Just a thought, take it or leave it. I hope it helps. I can not get the uppercase mazes to download please help me.